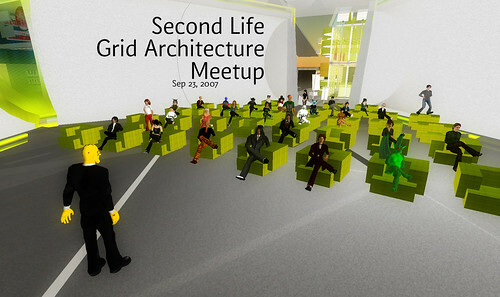 If you want to know more about the new Second Life Grid Architecture which Zero Linden talked about in this blogpost you should join me tomorrow at 11 am SLT in our sim Stadt. 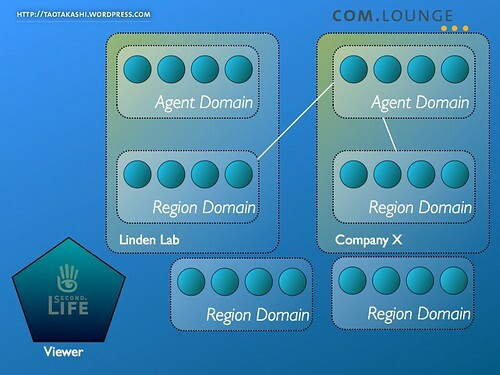 I will try to summarize what the Second Life Grid Architecture group is about, how you might be able to help and describe the proposed architecture a bit. I don’t plan to go too much into technical details as they are not set yet anyway. Many people these days have certain ideas of how a virtual world of the future might look like. And most of them agree on the fact that it needs to be distributed and open source. 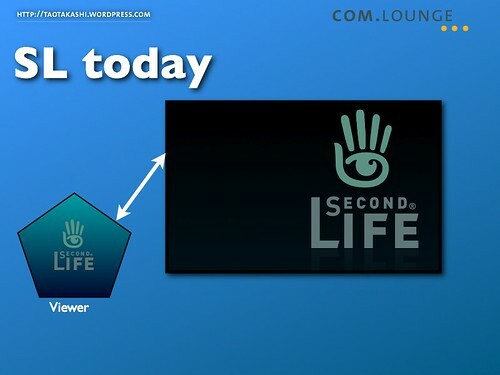 Some people also say that they are waiting for a virtual world after Second Life as they only see today’s limitation of it ignoring that Second Life is of course not finished (and according to Robin Linden never will be. But that’s quite obvious, the web isn’t finished yet either). Now Linden Lab was talking here and there about a) opening up their servers to make them open source, too and b) to make it possible to plug your own servers into the grid. As you might know many businesses demand such things as they want to host their own content themselves. They also made clear that these two things need to happen simultanously which means that there will be no open source server before the grid will be opened. This is due to business decisions I guess. Now opening up the grid is not that easy anyway as it involves many issues such as permission issues, topology maybe, object movement and so on. How to go from there? Now the big new here is that Linden Lab does not want to think about all this privately inside their offices but instead they want to discuss all this publically. For this to happen Linden Lab created the Architecture Standards Working Group which had it’s first initial meeting yesterday. It consist of a bunch of Lindens mainly hosted by Zero Linden and a bunch of residents who met mixed reality like in San Francisco and in-world connected by some audio gateway (which more or less worked 😉 ). This does not mean though that this group is fixed. It was more meant to present initial ideas and get the discussion rolling and actually everybody is invited to participate! No decision have been made yet and everything presented is not set in stone yet. In fact there are workitems which are about verifying the architecture and thinking about alternatives. How to learn more about all this? According to Zero and Rob Linden they are working on getting all the information presented at the meeting into the Wiki as fast as possible. The raw IRC chatlog in which Rob and other have been taking notes has been posted to the sl-dev mailing list (unfortunately the archive did not work because of PGP issues). The agenda of that meeting can be found here. 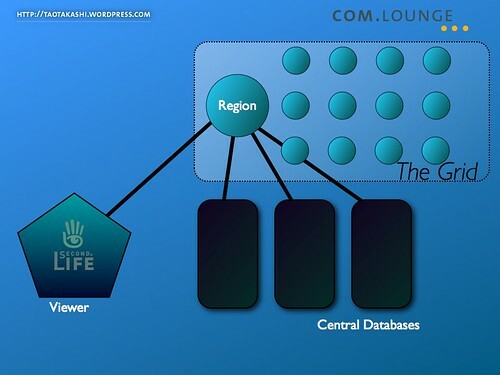 The discussion of the architecture will be done completely in the open which means with the existing communication channels: Wiki, Jira and the Open Source Mailinglist. Categories for this will be setup shortly. There have been workitems defined during the first meeting which need to be worked on. These workitems will not be owned by a person but many people can actually do work for a particular item. What needs to be done is very broad. One topic is collecting possible use cases and user scenarios which this new architecture needs to fulfil. Another one is finding missing pieces in it and again another one is actually writing code. But as you can see there might be some work to do for everybody who is interested in this project. There will also be follow-up meetings. Who gets to participate in these will simply be decided by whether they have done some work for the project or not. How these meetings will look like is somewhat open though. I guess there will be many sort of meetings, some just in-world, some mixed location like the first one and some maybe just in San Francisco (although an in-world event should be addable easily then). Of course there are also the office hours of the Lindens involved, mainly probably the one of Zero Linden. A little bit maybe about the coding part: The new architecture is supposed to be very modular and pluggable and thus one can imagine a future system with components from many parties. 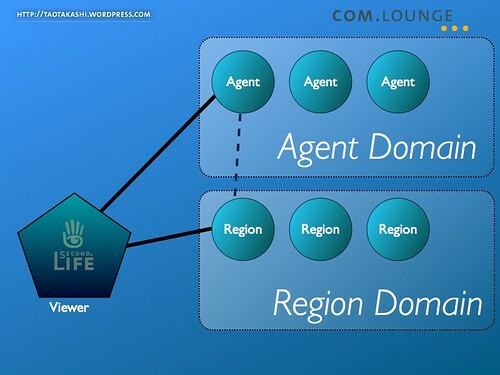 All these need to work together and all the underlying interfaces and protocols need to be stable. To get to that goal it is needed that people indeed do write code to implement some of these components. One of the components could in fact be OpenSim, another one maybe a new search engine. So we need a lot of people coding stuff to get as many components independantly implemented as possible and try to cross check if every component works with all the others. That’s the way to find flaws in the protocol. Soon I will follow up a post in which I will go more into detail about how the proposed architecture will look like and the story in how all this came into being (as much as Zero shared this with us). 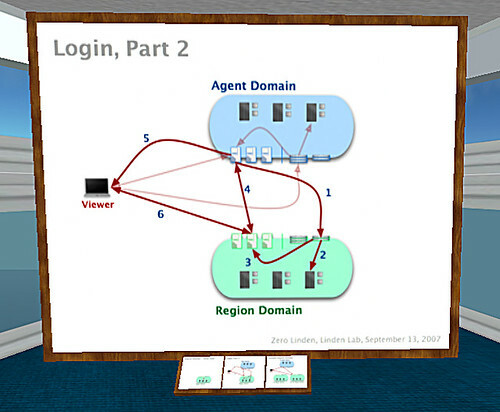 The slide above shows the proposed login process of the new architecture btw. But all in all good times ahead and a Hurray! to Linden Lab that they really made the decision to do all this in the open! 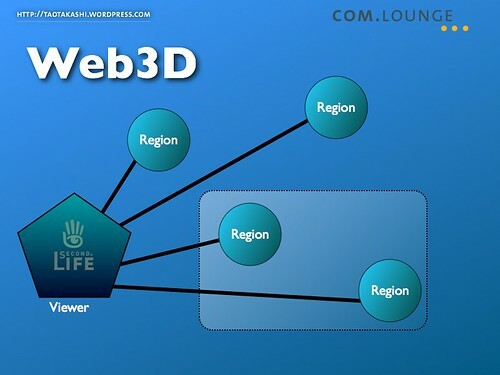 Update: I started the project on the Second Life wiki and please feel free to add use cases, ideas and questions. The european union is looking for votes for their e-Gov awards which are about inspiring cases in the field of e-government. PloneGov, a bottom-up open source initiative, was selected as finalists although competing with large projects funded by national governments. And this is why you should vote for it. More open source in public places should mean broader adoption and maybe even helps against one of the biggest threads of open source software which is software patents. Wait for the confirmation and log in. You can vote until September 7th, so do it now! 🙂 Help make Open Source a success!